I am a quilter. For the past 15 years, my quilting journey has been filled with endless joy filled with bright colors, warm feelings, and soulful peace. There is nothing quite like completing a quilt. I think this quilt is a perfect addition. So, apparently does my Ryan, who is sunning herself in the morning's brightness of the east-facing window. Ryan is my best quilt critic, although I've never gotten any negative feedback. Not only does this photo show one contented kitty, but it also shows some of the intense stitching that went into this project. Once again, I'd like to thank Leah Day, one of the best quilt instructors, for her quilt and stitch design. She is truly amazing, knowledgeable, and eager to help the rest of us become better quilters. This project was truly a learning experience and confidence builder. This is my third quilt using free-motion quilting, or machine quilting. It is certainly a case of the more you do it the better you get. I still have some issues, but I can work around them. Interestingly, one of my least favorite things about free-motion quilting remains, stitching in the ditch, which is one of the most basic quilting practices. It is basically stitching between seams to outline elements in the quilt. I can stitch a straight line all day without aid, but when it comes to following that seam line, I just can't seem to control my needle. It seems to misbehave as it jumps from one side of the seam to the other on its own. As you can see above though, even a little needle mischief is hidden by the quilt itself, once it is laundered. I have said it before and must reiterate--I love the ending of a project, but not just because it is finished. I've always been the kind of person that saves the best for last. Like that last bite of cake is always the one with the most frosting, the best moment in a quilt project, for me, is when it has come out of the washer and dryer. There is no other way to describe it than to simply say it is magic. Stiff, flat fabric sewn together goes into the washer, but a soft, pouffy quilt comes out of the dryer. Somewhere in between during that whole laundering process, it magic happens! As much as I love that last moment, it is always terrifying. I liken it to the first moment in quiltmaking which is just as scary. It starts when all those luscious fabrics that will make up the finished quilt are carefully chosen. They nestle together, folded neatly, to envision how the varying colors and patterns will compliment one another. Then, suddenly, the fabric is unfolded and meets the rotary cutter for the first time. Yikes! But in the end, when the magic is happening, who can really be certain if the colors will run or fade, or if the fabric will shrink so much that it compromises the integrity of the quilt? After all, placing a newly-completed quilt in the washing machine is the first time you give up control of what took months to complete and represents hours and hours of work. You just never know what will happen to your beloved quilt inside the washer and dryer. This practice has never come back to bite me--at least not yet! I always use Shout Color Catchers, which absorbs wayward dyes. I have never had a problem. If I did, I'm sure I would change my ways, but so far, so good. This process might be less scary if I pre-washed fabric, but I've never done that. Unless I am faced with a disaster, I never will. I've often said that I love every aspect of making a quilt, from choosing the design, to the selecting colors, to picking out fabric; I love the cutting and piecing, and of course the quilting. If I had to wash all my fabric and iron it before I used it, that would not make me happy. That would be work. I don't work at quiltmaking. I do it for fun. Besides, I love working with fabric right off the bolt. I realize the fabric is treated to give it integrity, but that just makes it easier to work with. If I had to wash it, I'd have to starch it heavily just to put that texture back again. So, why bother? There's the question of the hour. I haven't made that decision yet, but I'm working on it. This decision isn't an easy one either. Lots goes into making a quilt, so lots of thought has to go into it. When I devote months to a project, I want it to be one that I will enjoy throughout the entire process. So, stay tuned! I have been sewing Christmas table runners to give away as gifts for the last several weeks. This one will go to my daughter, Jenny. Consider this my version of a study in magic. This first photo, is what the item looks like when it is merely pieced and pressed, and pin basted. It is waiting to be quilted. At this stage it is hard to imagine the finished item. 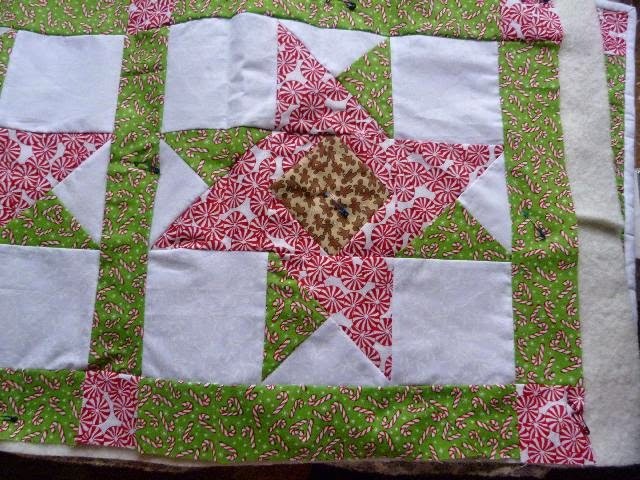 The piecing and joining of each block is the dominant feature here, which really accentuates the precision of the cutting and sewing of each piece. Imperfect points are obvious. If there are any puckers or less-than-perfect seams, this is where they are most evident. It is almost finished. The quilting is done and the piece is quilted, and the binding is meticulously added to finish the edges. Now, the quilting is the dominant feature. 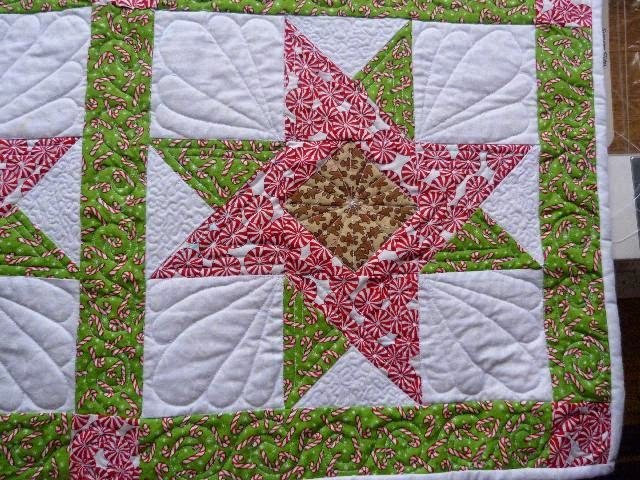 Any imperfections in piecing are far less obvious. It is the quilting that stands out. This happens to be machine quilting, but hand-quilting offers the same magic. So, even if the stitching isn't perfect, and it rarely is, the eye seems to take in the overall look of the project. But, it isn't finished yet. I never consider a piece finished until after it takes its first bath, both washer in warm water and dryer at the regular setting. To me, this is where the real magic takes place. I tend to stress out at this phase, because I've heard horror stories. Thankfully I've never experienced one. But because after all the work that has been put into a piece, the last thing you want to see is a color that bleeds into another or seams letting go, or whatever other calamity might be possible. Whenever I wash a newly-completed quilt, I always use a Shout color-catcher. This product has never failed me. I highly recommend it. I've never been disappointed, even when washing browns, reds, blues, and black fabrics. The color-catcher has always done its job. Each time I take a piece out of the dryer, I marvel at how it looks. 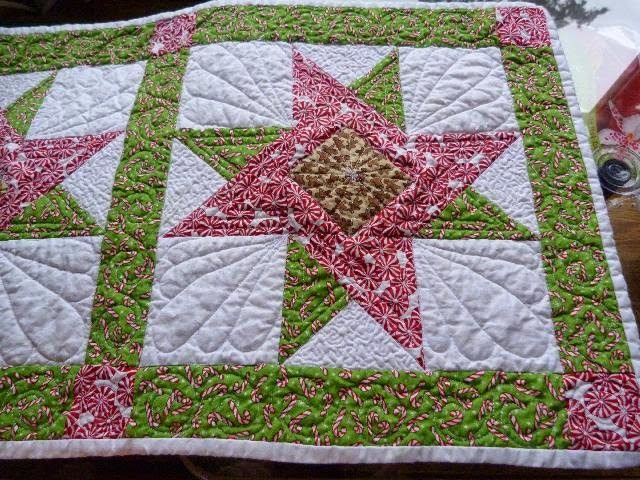 The quilting causes some shrinkage in the fabric that makes it look like it has relaxed and nestled in around the stitches. I liken it to putting your head onto a soft pillow at night. Your head sinks down into the pillow resulting in the kind of absolute comfort that allows you to fall asleep. I think washing a quilt enhances the beautiful texture that quilting creates. Gone are any imperfections. There is no more thought about imperfect cutting, sewing, or less-than perfect points. Even slightly wobbly seams just no longer matter. What results from all the processes that make up quiltmaking--each one that I love--is to me, just simply magic. Text and photos are the property of CHenrichs unless otherwise stated. Picture Window theme. Powered by Blogger.